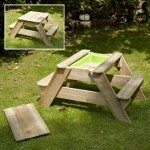 Welcome to our range of children's Sandpits and Water Tables. Playing with sand and water has a timeless appeal; digging and building, dreaming and creating. For extra sensory stimulation, you could even fill these Sand and Water Tables with other items such as plastic balls and pebbles. Domestic or commercial use - do you need a more robust and adaptable design for multiple users? Please remember to use the specially prepared 'Play Sand' in your Sandpit since it has a fine grain, is non-stain and non-toxic. Small quantities can normally be collected from local retailers such as garden centres, while larger quantities are available from builders merchants. In stock and ready to ship, the New All Out Play Square Sandpit (Commercial) is a mid-sized, premium quality, wooden sandpit, and can be used at home or commercial projects. 1.2m square it has a wooden cover. Now made with thicker timber and easier to assemble. The Standard Sandbox with a sturdy wooden Roof added. A timber cover is included and it comes as standard 1.4m x 1.4m, although other sizes are available. 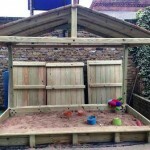 Large Rectangular Sandbox with wooden roof, suitable for commercial use, complete with 3-part timber lid. Standard size is 1.6m x 3m, but other sizes are available.